This is an elegant filter pattern from skiplagged. At first glance, it looks like the sort of checkbox filter we see all the time. 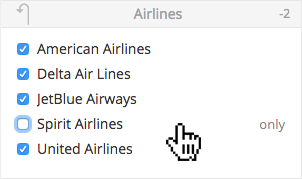 The bit I like is the “only” function that appears on hover. Clicking “only” unchecks all other options in the filter group. The feedback on how the filter is affecting the search results (-2 in this case) is nice too, but I’m not sure how obvious it is to the user. The “only” filter isn’t unique, Kayak has it as well. It was featured in this 2009 article about Best Practices for Designing Faceted Search Filters–shame on me for not noticing. Nonetheless, it’s a nice pattern worthy of using in the future. Mobile navigation must be discoverable, accessible, and take little screen space. Exposing the navigation and hiding it in a hamburger both have pros and cons, and different types of sites have different preferred solutions to the mobile-navigation quandary. In doing some research for responsive table patterns, a JQuery plugin from Filament Group with an great name came up. Tablesaw is a flexible tool for responsive tables. From a design standpoint, I’m impressed with the what they’ve done here. Selecting a precise value using a slider is a difficult task requiring good motor skills, even if the slider is well designed. If picking an exact value is important to the goal of the interface, choose an alternate UI element.